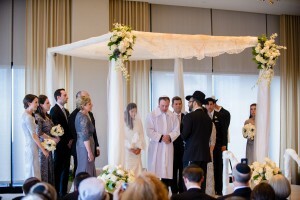 The blessings are most often recited by the officiant during the wedding, although this is not required – someone other than the officiant may be given the privilege of reciting the blessings during the wedding ceremony itself. 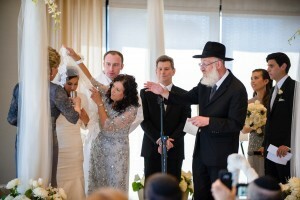 Honored guests who are not members of the wedding party are typically chosen to recite the blessings at the festive meal. 1. kiddush: the first blessing is the familiar sanctification of wine. 2. “…shehakol barah l’chvodoh”: the second blessing praises God for his greatness in being the author of all creation. 3. “… hayotzer adam”: the third blessing praises God as the creator of mankind. 4. “… asher yatzar et ha’adam betzalmo, betzelem dmut tavnito…”: the fourth blessing praises God as the creator of mankind in the image and likeness of God. 5. “… mesameach zion bebaneha”: the fifth blessing express a wish that the Jewish nation rejoice in the strengthening of the community through the marriage of two of its numbers, and praises God for perpetuating the Jewish nation. 6. 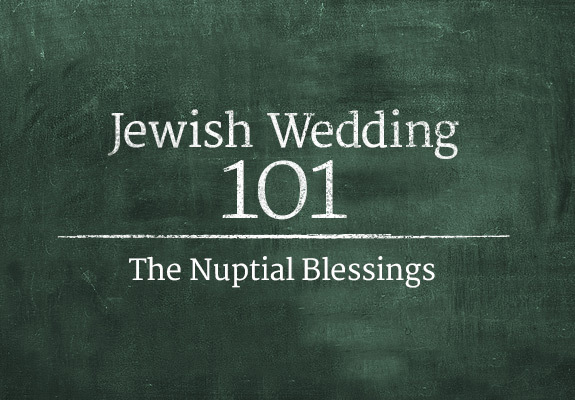 “… mesameach chatan ve’kallah”: the sixth blessing asks God to bring as much joy to the companions who are about to be wed as he brought to the world in his creation of Eden, and praises God for causing the bride and groom to rejoice. According to traditional law, a minyan, or quorum of ten adult males, must be present for the recitation of the Sheva Brachot. They are thus omitted from the wedding ceremony if fewer than ten men are present. Thank you to Hannah and Ari for sharing their beautiful wedding shots by Eric Stephenson Photography with us.